Summer is here; your lower legs and feet are at higher risk for sunburn. New York Foot Experts Blog Summer is here; your lower legs and feet are at higher risk for sunburn. Our feet and legs are often at higher risk for sunburn since many of us fail to remember to apply sunscreen to these areas when spending time outdoors. The risk for sunburn is present any time you expose your legs and feet to the sun — even if you are wearing sandals that partially cover the feet. 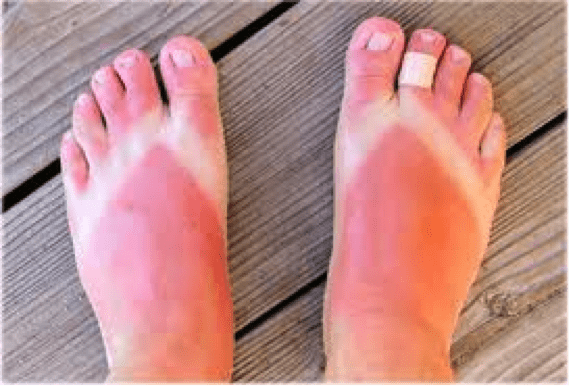 All surfaces of the feet and legs are vulnerable to sunburn, including the soles of the feet, which can become burned when laying out in the sun at the pool, the beach, or even in your own backyard. While sunburn to the lower legs and feet may feel uncomfortable and even painful, the damage goes much deeper than simply the surface of the feet. Exposure to the sun’s rays without sunscreen protection greatly increases the risk of developing both melanoma and non-melanoma skin cancers. Continual or repeated exposures greatly increase this risk. Next time you prepare to be outside in the sun, slather your favorite UVA and UVB blocking sunscreen all over your body, including on your feet and lower legs. If you plan on lying beach or poolside, coat the bottoms of your feet as well. Few things feel worse than walking on sunburned soles. If you plan on being outdoors for more than a few minutes, apply a broad spectrum UVA and UVB blocking sunscreen. Both UVA and UVB rays from the sun cause damage to the skin, which can cause your skin to age prematurely and increase the risk for skin cancer. When applied liberally several times throughout the day, sunscreen is the best protection from the sun. Apply sunscreen starting at your head and work your way down to your ankles, feet, and toes. Cover every exposed area -- including the backs of the legs, all the way around the ankles, and the tops of the feet. Even those who apply sunscreen religiously tend to miss these areas. If you’ve been in the water, be sure to reapply sunscreen often. Even when wearing shoes or sandals, don’t forget sunscreen, and cover every exposed area of skin, right down to the edges of your shoes or sandals. In addition to liberally applying sunscreen to your legs and feet, there are a number of other steps you can take to keep your feet and legs healthy. First, always wear the appropriate shoes for your activities. 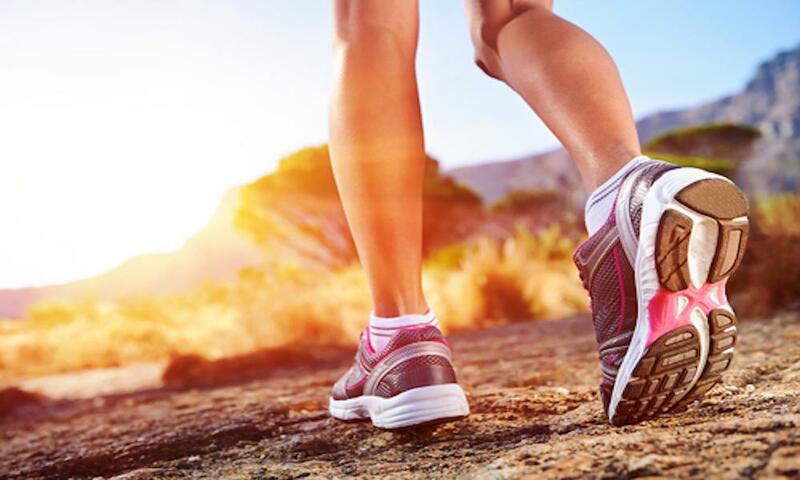 By matching your shoes to your activities and adventures, you will reduce your risk for sprains, fractures, and other summertime injuries. If your shoes are likely to become wet during your summer adventures, allow them to dry completely before wearing them again. Re-wearing shoes that are damp instead of allowing them to dry completely may create an environment that promotes bacteria and fungus growth. Drying shoes completely will prevent such growth and keep your feet happy. In addition to wearing the proper shoes and sandals this summer, consider carrying a few small essentials with you to treat the occasional foot, ankle, or leg problem. In addition to carrying sunscreen, pack a small kit with bandages and basic first aid supplies in case of scratches, bumps, and bruises, and be sure you know how to use everything in your kit. Add a moisturizing and hydrating lotion for the feet, and bring aloe vera lotion in the event you do end up with a sunburn. If you suffer from diabetes, peripheral neuropathy, or from any other disorder that could impact the health of your feet, be especially vigilant with checking the health and condition of your feet and ankles every day. For those with decreased sensations, it is especially important to visually inspect the skin of your feet and lower legs regularly during sun exposure, as you may not feel the heat of the sun with the same intensity as others. Unfortunately, this increases the risk of serious sunburn. Check your skin regularly, apply sunscreen, and then reapply sunscreen several more times throughout the day. 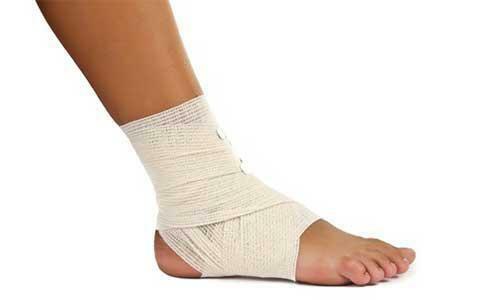 Ankle sprains are an incredibly common injury. A little precaution and preventive exercise, however, can help you avoid this annoying and sometimes debilitating injury. Consider these five tips to promote optimal ankle health. Uncomfortable shoes are nothing new and have been around for hundreds, if not thousands, of years. And fashion shows no signs of giving feet a break any time soon. Do your feet need TLC before you expose your toes this summer? There’s still time to clear up those painful and unsightly corns. You’ll be digging your toes into the sand in no time with a little help from your New York Foot Experts. Buying a new pair of shoes can feel like a celebration. While you want to look good, you’re setting yourself up for chronic foot problems or other medical conditions if you fail to consider more than just color and style. Toenail fungus is a common problem that affects many adults. Nail polish may mask it, but it won’t make it disappear — for that you need proper medical treatment. It can take months to banish toenail fungus, so the sooner you start treating it, the better.